Fun and Relaxation at The River Cottage! You'll make great memories here . . . The cottage is the perfect place for friends and family to gather as well as a great spot for writers, artists, scholars, and business travelers to work in peace and quiet. Public boat dock and launch are a short walk down the lane. Good lake swimming beach, hiking, and biking nearby. Fun area to explore - good food, music, wineries, and natural beauty galore! Burlington and the airport are just 15 minutes away. We love the nearby river's energy and close access to Lake Champlain! Stay warm and cozy with our Danish Morso stove. Additional seating can be easily configured. Small set with analog receiver gets 6 channels. Small portable player. Can be connected to the small tv. Cookbooks, children's books, local author's historical fiction. Badminton net in yard. Horseshoes available also. Cards. Large grassy lawn and wildflower meadow. Kitchen garden for fresh herbs is currently being made ready for puttering. Courtyard for sunbathing or star gazing! References for a driver, a massage therapist, and a chef for on-site assistance. Rental kayak and paddle board delivery available. Bike rental nearby. VT Meals and Rooms # MRT-10856525. A cute cottage with plenty of space for our family and close to access to many attractions. Everything listed was very overrated! When I originally booked this place in January the pics were different and amenities that are displayed are very sneaky how they advertised this property! We had reserved for eight and had eight but not enough towels (the ones provided were torn ripped and had holes and stains) and Seating for eight like advertised one whole table is missing that pics show! Place was not very clean as I would expect! We are all itching and have several bites and are all crawling in our skin! More than one of us have rashes and pray it is not something more! No a/c and house is tremendously hot! We had to go buy fans bc one available was size of a cereal box and only one! There were ants all over our stuff in mornings when we got up in morning after only a few hours sleep! It is a short long walk to river and swimming is not there like advertised when I booked! Just overall disappointed! Will never recommend this place to anyone! She was welcoming and came when we were unpacking and was not dressed appropriately! I had four children and a family visiting while we were getting settled and got questioned on how many were there and only eight was allowed to stay which is all we had! I can see pictures are changed from when we booked so I believe more than myself were misdirected by pics and descriptions of this house! No really good cell service so we knew there was internet! Tried to connect to internet a couple hours before checkout to get code to put key back and was turned off and couldn’t use! Not a quite neighborhood because neighbors like to rev car motors and do burnouts with children on bikes and also on way to boat launch! Lots of traffic! Cooking pans are are scraped up and burn your food! Just overall experience was not any I ever want to have again! Probably will always pay more per night and book a hotel! Never be back!!! Adorable little cottage! Perfect location! We loved staying here! Plenty of fun towns nearby (Burlington and Stowe were some of our favorites! ); the river is a short, pleasant walk from the house, for fishing and enjoying the quiet beauty; Lake Champlain is also nearby, and the mountains are just beautiful...such a lovely area! I would come again and again! This little house is simply and charmingly decorated, the beds are comfortable, and our hosts thought of everything...detailed info about the area, well-stocked kitchen, good reading and art supplies, bikes, a stroller, even a fire built and ready in the beautiful wood stove. She really thought of everything and we had a lovely time! We have littles, and it was so nice for them to have room to ride bikes and play in the yard. They loved all the little nooks and crannies of the house, and I loved that it was so toddler-friendly...an easy house to have our 2-year old in. Really great! Just as a heads up, this home does not have AC...we happened to come in what the locals told us was an unusually hot and humid spell for Vermont, so we were pretty sticky in the house. I do love living with the windows open, so when it's more normal Vermont weather (cooler and not humid), I'm sure it's wonderful! Our host was very inviting and welcoming, and we were very impressed with her attention to detail. Thank you so much for a place to make some wonderful memories!! I highly recommend this little place!! Although our purpose on visiting the Burlington area was for a conference/training on Classical Education, staying near the river at the River Cottage made it feel like a vacation. First of all, driving to and back to River Cottage from Williston was quick, easy, and picturesque. We got to enjoy downtown Burlington, Lake Champlain, all so close. The layout of the house provided several sitting areas for the four adults and three teens. We all enjoyed sitting outside by the fire and walking to the river. The beds were very comfortable, except the sleeper couch. Even when more than a few needed the only-one bathroom, we worked it out. So glad to know now about this charming house, for sure will use it in the future. We just spent a week at the River Cottage and loved it. Amy and Greg were fantastic hosts; a wealth of knowledge about the area and even watched our 15 month old for 10 minutes so I could load the car since my husband had a cancelled flight and I had to get out of the VRBo on my own with a toddler. Above and beyond. It also gives you easy access to both Burlington and the Champlain Islands - something for everyone (great toddler activities, activities for my teenage nieces who visited, and activities for my in-laws). The house itself was great - well stocked, plenty of space, and great yard complete with a badminton set. I would highly recommend it. Great find for UVM graduation stay with family. Despite rain, it allowed for some time for family to share some special moments and even family photos at the dock! Thank you so very much. 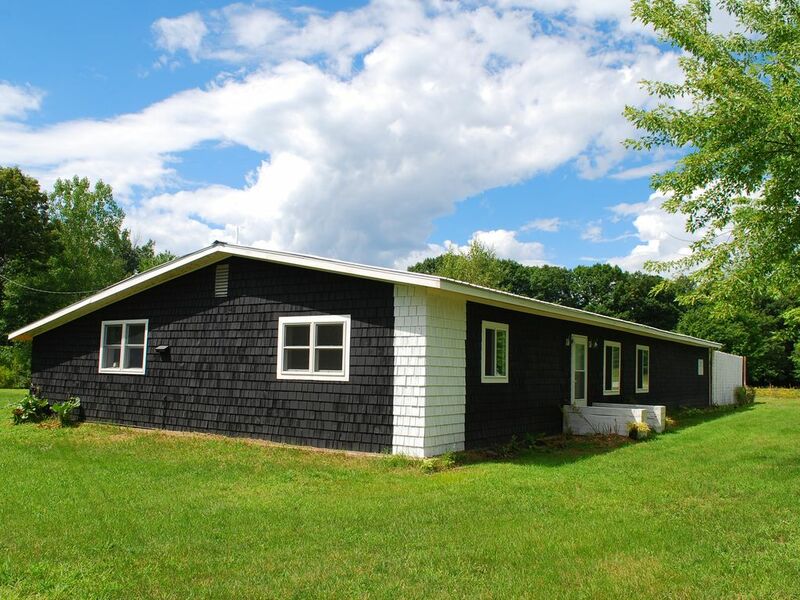 The River Cottage is nestled in a quiet neighborhood bordered by the Lamoille River on one side and the Sandbar Wildlife Refuge on the other and conveniently situated along the Rt. 2 bike route. This fabulous boat landing with a recently constructed dock is just down the road making easy access for water recreation. A great value. Modestly priced to attract visitors during this, our first year.